Capture animals for your zoo, but be sure to capture animals that are compatible or your zoo will be a mess! You’ve got the land, built the cages and pens, and are ready to open your zoo! One problem, though, you have no animals! No worries, you can go out and capture the animals you need to fill your zoo. Oh, but there’s the type of animals to think about. You can’t just go putting lions next to kangaroos or fill an entire section of your zoo with moose, after all! Jeepers, owning a zoo is work! 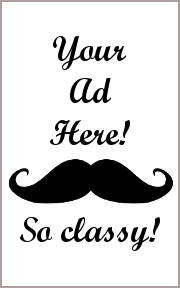 No time to think about your career choices now! Go grab your net and start bagging critters! 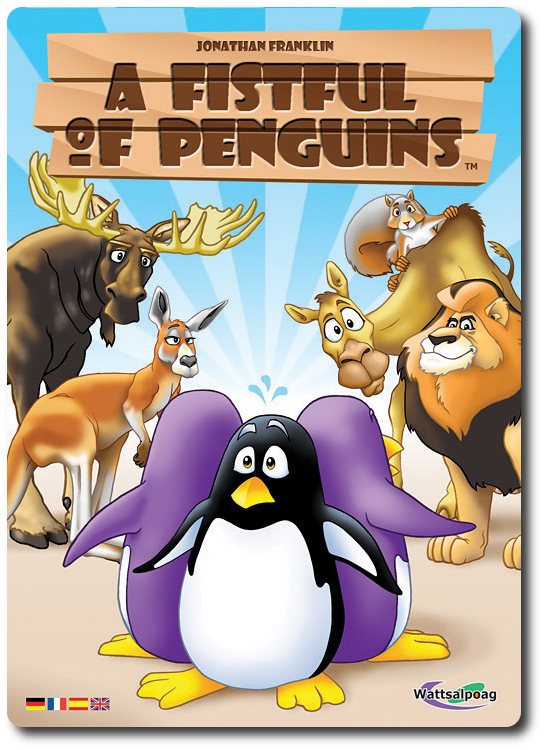 A Fistful of Penguins, by Wattsalpoag Games, is comprised of 9 six-sided dice with each side depicting one of six animals (penguin, squirrel, moose, kangaroo, lion, or camel), 36 Penguin meeples (30 purple and 6 yellow), 90 mini Poker chips (24 red, 24 blue, 6 black, and 6 brown), and 3 reference cards. Caution should be taken with baby geeks around the house as some of the components could be a choking hazard. Note: Prior to your first game, you will be required to place stickers on the brown and black mini Poker chips. This will not take you any longer than 5 minutes, but do budget your time appropriately if this is your first game and you have not yet opened the game box. To set up the game, have the players sit around the playing area and hand out the reference cards so that all the players can see them when needed. Give each player 6 purple Penguin meeples and $10 worth of mini Poker chips (yellow chips are worth $1, red chips are worth $5, and blue ships are worth $20). The remaining Poker chips and Penguin meeples should be readily available and placed to one side. It might help if one player becomes the Banker and manages all the Poker chip and Penguin meeple transactions during the game. That’s it for game set up unless you are playing the advanced version of the game. If you are, ensure that every player also has 1 mini black Poker Penguin chip before starting. A Fistful of Penguins can be played three ways: Normal Game, Solo Game, or Advanced Game. To play the normal game, each player will take turns rolling the dice, with the number of dice available to the players steadily increasing by default. Each player will take three turns in an attempt to make as much money as possible. On a player’s turn, they will take the default number of dice (4 dice the first round, 5 dice the second round, and 6 dice the third round) and roll them. The player has the option of buying more dice by spending Penguins. For 1 Penguin meeple, the player can roll a spare dice not yet part of their total dice allocated for the current round. When the player rolls the dice, they are attempting to create certain patterns to maximize the amount of money they will be awarded. The patterns can be complex, but the game comes with a reference card that makes matching the animals easy, but not intuitive at first. For example, rolling Penguins awards the player Penguin meeples, rolling Squirrels allows the player to collect money from other players, and the Kangaroo awards an amount of money based on the number of those animals showing. There are also combinations such as lions not allowing Moose, Kangaroo, or Squirrel to score and a Moose plus a Squirrel will award money, but not a Moose on its own. Complicated? A bit and that’s why it is important to have the reference cards on hand. A player has a number of options on their turn and they can be done in no particular order. A player can continue to roll as long as they have dice or Penguins available. A player can stop and collect their Penguins and Poker chips at any time, but once money is collected, their turn is over by default. Any unused Penguins are kept by the player along with any new Poker chips. The dice are then passed to the next player. This continues three times, allowing each player to take three turns. To play the solo game, all the same rules apply as stated in the Normal Game. The player takes their three turns in a row, making sure to add to the default number of available dice each turn. The Advanced game allows players to purchase dice from other players and changes the number of dice for 5 and 6 player games. Unless otherwise stated below, the game play is the same as the Normal Game. When the active player takes their starting dice, all the other players take one of the unused dice and roll it, hiding the rolled value. They now place a number of Poker chips and their black Penguin chip (if they like) next to that die. Note that the Penguin chip shows a single Penguin on one side and two Penguins on the other. Once all players have completed this, they reveal their roll. Any Poker chips and Penguin chip next to that die roll result is the asking price for that die value. The active play may now pay the asking price for that die and get its face value. Whenever the active player rolls the dice again, all the other players can re-roll their dice and change the asking value. Once a player’s die is purchased, they can no longer participate in the bidding. For a five player game, each player is given 3 dice on their first turn, 4 dice on their second turn, and 5 dice on their third turn. For a six player game, each player is given 2 dice on their first turn, 3 dice on their second turn, and 4 dice on their third turn. The game ends after all the players have taken three turns. The players count up their winnings using the Poker chips. Each Penguin meeple they still have is worth $1. The player with the most money has the most successful zoo and wins the game! In the event of a tie, there is a showdown. Each player who has tied takes 2 Penguin meeples and 7 dice. Those players then must make as much money as they can on one turn. The player who makes the most money during the showdown is the winner. For Solo Game, the goal is to beat your previous score. 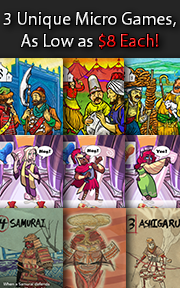 To learn more about A Fistful of Penguins, see the game’s official web page. There is simply too much math in A Fistful of Penguins to make it a game that my 4-year-old could play well. He’ll be teaming up with me as my official roller of dice if he wants to play. 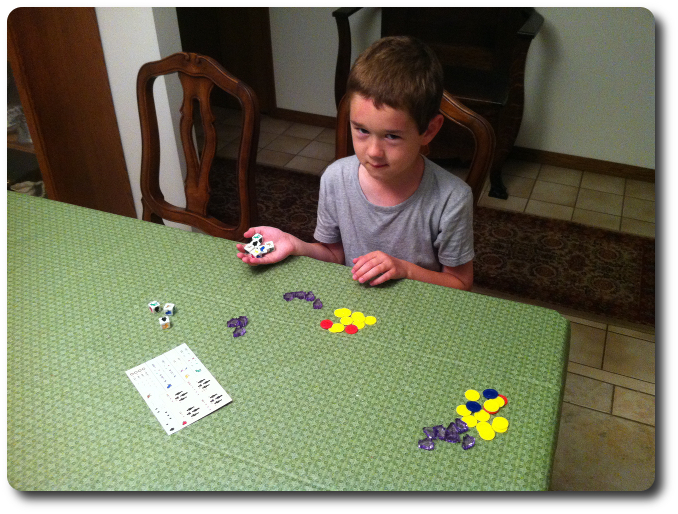 My 7-year-old shouldn’t have any problems with the math or how the dice are collected for points. Both of my two oldest little geeks have played many hours of dice games and shouldn’t be tripped up by what is being asked for. Nevertheless, you simply do not know until you try. Explaining the rules of the game took all of a minute or two. Explaining how the dice interact took about 5 minutes. The trick you need to focus on when you introduce the game to new players is making sure they understand how to read the reference cards. I cannot emphasis enough how important this is. Knowing what dice do, how they impact other dice, and what you will get for them if turned in is the most important part of this game. Failure to recognize specific patterns and match correctly will cost the player lots of money. After I was positive my little geek understood how to read the reference card, we were ready to play. Before we rolled, I asked him his thoughts on the game so far. The little geeks are ready to roll! Let’s get our zoos going and see if the game is worth the price of admission. A Fistful of Penguins turned out to be a pretty challenging game. Not the rolling and collecting points, mind you, but knowing when to push your luck to keep ahead of the rest of the players. 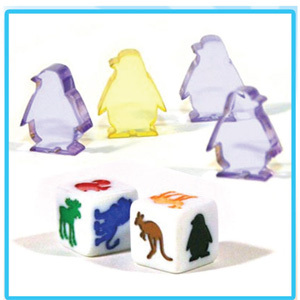 The die results are all luck based, but a player can spend Penguin meeples to keep trying. This gives the players more opportunities but not the ability to influence the level of luck. In fact, the only skill really needed in this game is knowing when to stop to collect points. This was not lost on my 7-year-old and he very quickly started to take a lead. He won the first game without any problems, beating my score by a full $30. He lost his second game, but not by much. He greatly enjoyed A Fistful of Penguins and I was very proud to see him thinking through his turns. Parent geeks also had a wonderful time with the game. They really liked how they could push their luck and seeing where they were at in regards to their opponents. They also liked how each round gave them more dice. More dice can give you much more points, but it can also means more dud rolls. The Parent Geeks very quickly fell in love with the Penguin meeples and utilized them to the maximum to take advantage of poor rolls and gain more points. Even the non-gamers enjoyed their time with the game and were ready to play more when the game concluded. Gamer Geeks found the game to be enjoyable but simple, which is exactly how I would put it, too. But not “simple” as in “stupid”. The game lacks depth but the player does have important choices to make. These choices will have a major impact on their final standing in the game. The heavy amount of luck in the game, however, kept the Gamer Geeks from viewing A Fistful of Penguins as anything other than a quick dice game. Not a bad thing. What they did enjoy was the Advanced Game and allowing the player the create a price for dice. This increased the game length, but also added a new element to the game that engaged their interest and allowed for player interaction. Gamer Geeks, this is a dice game that will have you making choices and risking your score not based on game difficulty but based on the luck of your opponents. You will need to push luck often to get a big score to ensure you keep ahead of the pack. This makes it a fun game, but not one you’ll be making the center piece of your gaming day. Perfect for a light filler and a nice way to start a gaming evening or ending it. Suggest using the Advanced Game play if you want player interaction. Parent Geeks, this game is great for families and will have your family and friends doing the math in their head to attempt to get the “big score” to claim victory. The game can move slowly at times if the active player is not yet skilled enough in mathematics to complete simple addition in their head or if they are the type who vapor locks easily. The level of risk on each roll is sufficient enough to push a player but the player never loses anything other than possible points. Most of the frustration will be felt based off hindsight and loosing by just a few points. Child Geeks, this is a game that is going to challenge you and you will need to start learning when “enough is enough”. It’s all about risk vs. reward and you must logically think through your choices, while at the same time consider your current standing at the table in regards to points. Are you lower than the rest? Then you need to push your luck more. Or, perhaps you are far ahead of everyone? In which case, don’t bother pushing your limits unless you want to increase the distance between you and the other players. A Fistful of Penguins is a fun little game and I found it to be perfect for my family and friends. As a Gamer Geek, however, it left me a bit wanting. I enjoyed the game for what it is, but I was consciously aware that I was never in any type of jeopardy. You either make a few points or a lot of points each round, never none. Oh, sure, it is very possible, but I have yet to see it happen. Even a person who rolls a lot of Lions can just re-roll using a Penguin. If Penguins were hard to come by, that would make them all the more precious, but by the time my games ended, I was usually had more Penguins than I knew what to do with. Despite the lack of game depth, A Fistful of Penguins is a fun game and plays fast with the right people. It provides enough to make the players think but slaps them with a pretty soft glove if they make a poor choice. This makes the game perfect for families and little geeks, but as a Gamer Geek who likes the occasional punch in the face from a game, I pushed away from the game table hungry for more. But as an appetizer, A Fistful of Penguins is just right. Do take a look at this game if you think your family and friends would enjoy a light dice rolling game where luck and risk go hand-in-hand. Tagged Animal Games, Children's Games, Dice Games, Father Geek Approved, Gamer Geek Approved, Parent Geek Approved. Bookmark the permalink. I appreciate this review. The name of the game is appealing in the first place, but hearing that the gameplay works well for all ages adds to that appeal. I’ll have to keep an eye out for this game. It would make an interesting addition to our gaming nights. Glad you think so! It does require the player to think which makes it a lot more than a mindless roll-and-then-roll-again dice game. Pushing your luck is necessary to score big, but only if the player thinks they need to put distance between them and the other players. If you are playing with little geeks, do expect the game to go longer if you want them to do all the math. But after just one game, I bet they’ll have it down. Have fun!